5 times to prevent the brass sticking in the sizing die. The Dillon lube works much better IMHO. the die as far as possible, I still can't get some of the brass to resize to spec. brass cannot be resized properly? The chamber on the SCAR is tight FWIW. Which .308 dies do the Files use? fired and had decent accuracy using the FAL and SCAR. a second case head separation occurred. which stretches with each firing. I shot up all my PMC reloads and tossed the brass. problem occurs when the case is extracted. 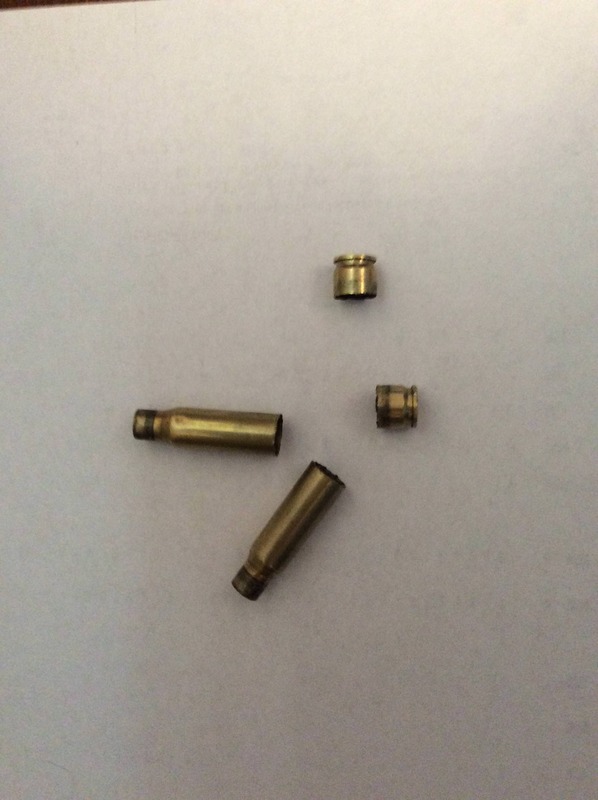 The brass in question is twice fired WCC 10.
occurred using BL-C2 and TAC but not with Varget. separations were a headspace problem. Make your own lube. Lanolin and 99% alcohol. Was this brass first fired in a machine gun? I've had machine gun fired brass that was stretched all to hell and I always do the paperclip test on that brass and find plenty that have case separation on their way. A few years ago about 10 rounds into my first resizing ever of 308, I totally seized a case up in an RCBS die with Hornady One Shot. Not impressed with that stuff. Dillon spray lube or Redding wax only. Also in the end bought Redding dies and much happier with the results. so it could very well been shot in 7.62x51 belt fed MG.
Dillon lube from now on. RCBS X-Die, but that is just a feeling. wondering if my FAL has out of spec. headspace. Tighten the the stem on the primer pin. No way that a 308 die isn't going to bump the shoulder. You sure about the sizer caliber? If you are using a standard .308 die and sizing to .308 headspace, you could be working your brass too hard. Firing in a 7.62 NATO chamber can stretch your brass. It may only be a few thou, but it can make a big difference in a short time. Try setting the shoulder back a little less. RCBS lube 2 seems to work better for me than any of the others. Are you lubing the interior of the neck? Are you removing all the lube before seating your projectiles? Also, scrub the heck out of your chamber. After 50 plus years of reloading, I have had my share of case separations. There is plenty of excellent new brass available. Skip the once fired crap and you will be well on the way to a more enjoyable experience. the chamber on those is HUGE ! Thanks Art. I think the SB X-Die which squeezes the OAL back into spec. my be overworking the brass. My only issues I've had with separations was CBC. I bought a couple of 1000 rounds during the shortage back in 2013 and shot it up 1st and kept the brass. Had one case separate midway and the other snatched the rim at the extractor. Many people do not know how to correctly adjust a sizing die. The old 'screw the die down until it hits the shell holder' instructions that accompany the die are the main culprit. As others have stated, machine gun-fired brass has long been used by many people with startling success for many years. Initial sizing with a .30-06 die body does seem to help, and although it requires an extra step may well be worthwhile. The critical first step that many don't take is determining just how long the chamber(s) of their rifle(s) is/are, and adjusting their .308 FL die accordingly. Excessive sizing (shoulder setback) causes a lot of problems. You DO need to set the shoulder back ever-so-slightly farther to insure smooth functioning in a gas gun than you do a bolt gun. That doesn't mean that you need to set it back an excessive amount. Add multiple rifles with different chamber dimensions into the mix, and you may not have a one-size-fits-all situation. Measure the chamber(s) in your rifle(s). Adjust your sizing die accordingly. That should minimize the cartridge headspace problem, and ensure that you get normal brass life. I allow for .003" shoulder setback, as an absolute minimum in my gas guns. On that note - it has been demonstrated that a properly adjusted X-Die can allow more than the normal 4-5 loads (normal for gas guns) with a piece of brass. Some have reported up to 20 loads in M14-type rifles. I'm not saying that you will automatically get 20 loads out of your brass in your rifle(s) - simply that is has been done. when I shoot up the rest of this lot, I am going to see more case head separations. 6 firings. So I am guessing the WCC10 lot may be the culprit. Use a case gage to set up your sizing die. Set shoulder to match dimension of factory ammo. Discard brass after firing 3 times in semiautomatic. Or is that a recommendation for .308? I got was not the best. Last time I had an FAL at teh range, I used 43 gr BL-C2, 150 grain Hornady SP, whatever primer, and mixed commercial range pickup brass. Dies I use are Lee RGB, RCBS FL, or once in a while RCBS small base, whichever I feel like using at the time. No functional issues. I also banged a bunch of that same garbage load though an Israeli 98k Mauser. The only thing here is with NNY brass, that load just starts to get a sticky bolt in an Israeli 98k, but that is something that I knew about already. Last edited by Mebsuta; June 17, 2018 at 23:21. For an FAL, yeas, 3 firings are about it. I start having separations on firing number 4. This does not apply to my AR10, or any other .308/7.62 NATO rifle i've ever had. I set my headspace on reloaded cases about .004". That's enough for reliability, but not as much as SAAMI, which can get as high as .010". am using the Dillon trimmer, brass is FL sized and trimmed at one station. for the X-Die. Doesn't fit in the case gauge. Screw the die down a 3/4 turn more, the case gauges properly. So I put a newly trimmed brass in the die and reset the mandrel. Then I size the previously fired brass and it gauges fine. So the moral of story, I didn't have the X-Die set properly to cam over the presslike it said in the instructions. Live and learn. problem after 3 or 4 firings. I use RCBS X Die's for 22 Hornet and 223/5.56 but not tried with 308/7.62. They are the Bees Knees for loading Hornets and work well with 5.56 if first time through my process they are trimmed to length. All of my 308/7.62 brass make sure to use a dental pick to feel for beginning signs of case head separation and can feel it before it happens. That said have Lake City 5.56 brass with six loadings and no issues all the time. In fact have gone over ten loadings when I was young and poor but made sure at some point to anneal cases so didn't get work hardened. Now I load them four times then fifth loading cycle use for long term storage/end of world ammo use or for shooting at ranges where recovering brass is not allowed. Thus after six firings cases will be scrapped unless fail the dental tool test and may be retired sooner but not often. Recently loaded some cases that have four cycles through G3's and CETME's. Don't know how many times have been told can't reload cases fired in fluted chambers but been doing it for years. I check my 308/7.62 brass for internal cracks, load four times and and fifth time is loaded for disposable brass or long term end of world use. As with 5.56 was a time 30 years ago where milked every cycle possibe out of 308/7.62 brass and loaded brass up to ten times for use in my M1a's. Have 45 acp cases with over three dozen load cycles but it's so low pressure will take a lot and when finally splits my 1911's send bullet where needs to go and chunks the split case out just fine. Odd thing is with as many loadings do with rifle brass until year before last never had to use a stuck case remover in a rifle. I trim my 308/7.62 every load cycle and am very careful not to overwork my brass by setting back shoulders too much. I don't shoot FAL's as much as M1a's and other 308's and may be why my brass lasts longer. But at fourth loading they go through annealing machine. If I shoot full power ammo through an FAL with suppressor I scrap it as even after turning down gas unless swap gas plugs it flings it into next week and bends the rims but seldom do this as know it's beating up the rifle too. Usually use subsonic ammo with full gass when run cans with my FAL's and it's fine for loading. Glad you worked out the X Die with your loads as been considering a 308 X Die or Dillon press mounted electric trimmer. Had a deal worked on another forum for a Dillon 650 with case feed and plan was to set it up for 308 with electric case trimmer, case feed, bullet feed and taper crimp die. Guy had it new in box with case feeder and set up for pistol caliber never unboxed. I posted "will take", sent PM and started working on shipping price so could pay when suddenly seller stopped responding to my messages and a little lurking figured out he sold it to someone local he didn't have to ship to. Could have at least told me, bought a 650 before Sandy Hook and had not unboxed when Dillon went to a two month wait on presses and sold my 650 set up in 5.56 for $390 more than paid for it and all accessories. Now building a new bench to put both my 550b's, three Square Deal B's and a 450. Building with enough room for a 650 and consolidate all my progressives on one bench, then get all my single stage presses mounted back on there bench and bullet lube/sizers on their bench. Currently have a Rock Chucker pulled to fit a 550 two bullet sizes pulled to fit a Square Deal and 450 plus have my shot shell press on casting table and ture press on case prep bench. Amazing how much equipment piles up over the years especially when don't like to swap calibers on progressive presses.